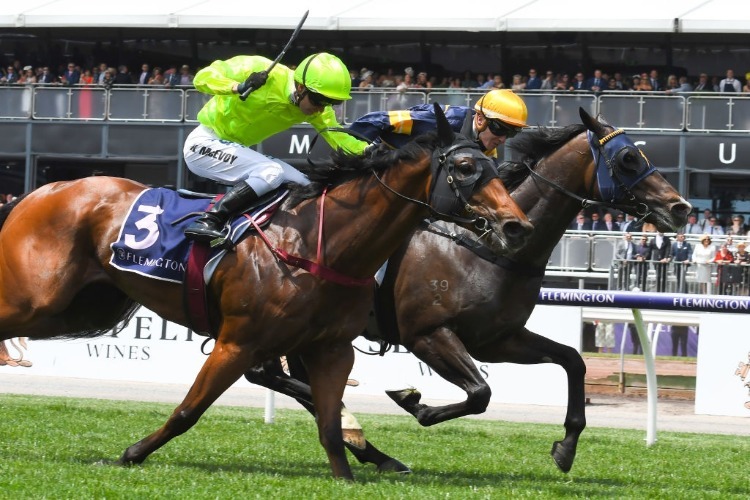 The Mike Moroney-trained Loyalty Man has raced to victory in a 1600m benchmark race at Flemington in his third start back from an injury lay-off. Mike Moroney is happy to have got it wrong after Loyalty Man prevailed in a photo finish to the opening race on the final day of the Melbourne Cup carnival at Flemington. The Michael Moroney-trained Loyalty Man ($7), having his third start back after a year off the scene, held on to deny $2.60 favourite Manuel in Saturday's Melbourne's Own 3AW Trophy (1600m). Loyalty Man had his head down at the right time to win by a short half-head, with 3-1/4-lengths Al Passem ($3.30) third. The victory was Loyalty Man's first in almost two years. "The diagnosis wasn't very good for a while but we persevered and gave him the time out."